It is worrisome that salaries are consuming as much expenditure as equipment. Ajai Shukla explains. After the dust settles around the 'one rank, one pension' agitation by ex-servicemen, a crucial question will remain: are the military's manpower policies sustainable? Since 1947, military planners have, ostrich-like, regarded manpower as a cheap and plentiful resource. Human resource policies have never got the attention equipment acquisition has. The acceptance of OROP, coming after major salary increases in the 6th Pay Commission, makes it essential to ponder the manpower question more thoughtfully. Consider this: out of this year's Rs 246,727 crore defence allocation, Rs 93,216 crore was earmarked for salaries of the military's 1.5 million uniformed and civilian employees. That is 38 per cent of the defence budget, matching the entire capital budget of Rs 94,588 crore for new war-fighting equipment like guns, tanks, fighters and warships. If it seems worrisome that, in low-wage India, salaries are consuming as much expenditure as equipment, there is worse. The salary figure does not include defence pensions, which are not included in the defence budget. It is instructive to examine manpower costs with military pensions included, as they are in defence budgets everywhere. Factoring in this year's pension allocation of Rs 54,500 crore, defence spending rises to Rs 301,227 crore. Adding pension allocations to the salary bill, actual manpower costs would be Rs 147,716 crore, almost half the adjusted defence budget. That is before factoring in OROP, which Defence Minister Manohar Parrikar said on Saturday would be Rs 18,000-22,000 crore. 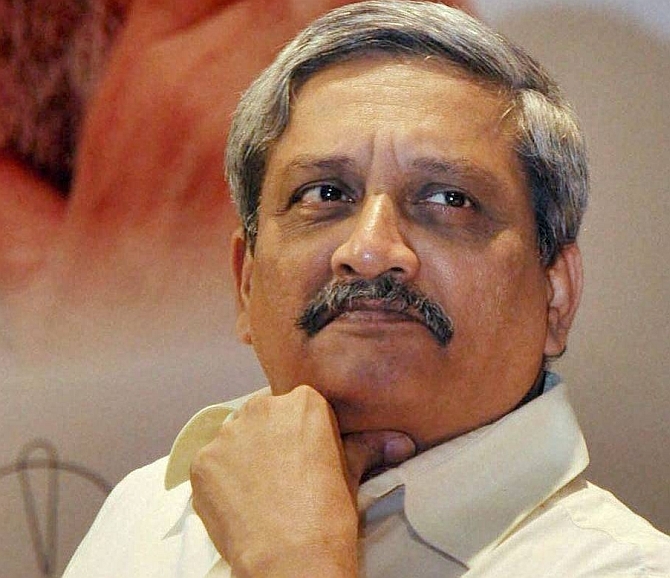 Later on Saturday, he extended OROP to ex-servicemen who had taken pre-mature retirement. That is another Rs 6,000 crore, boosting this year's overall OROP outlay to Rs 24,000-28,000 crore. Factoring in the lower figure, OROP will raise actual defence spending to Rs 3,25,000 crore. Of this, personnel costs will be Rs 1,72,000 crore, or 53 per cent of defence expenditure. This figure should alarm most governments, forcing generals, admirals and air marshals to think hard about cutting down manpower costs to leave a greater percentage for equipment modernisation. Two straightforward solutions present themselves: either reduce the military's overall numbers or reduce the pension bill by hiring a much larger percentage of soldiers, sailors and airmen on "short service" contracts that bind them to serve 5-7 years in the military and retire without a pension. Theoretically at least, there is also the option of compulsory military service or national conscription. However, the defence ministry believes this "would go against the democratic ethos" of India and could lead to "unemployed youth trained in military skills joining the ranks of the undesirable elements". Major global militaries, most recently China's People's Liberation Army and also the US, British and French militaries, are currently slashing numbers. This rests on the logic that, with modern weapon systems pulverising the enemy with firepower, fewer soldiers are needed to win battles, and paying fewer soldiers saves money to procure better weaponry and more firepower. India, inexplicably, is going in the opposite direction. The United Progressive Alliance government sanctioned a new, 90,000-man mountain strike corps for the Himalayan frontier, for which the cabinet cleared expenditure of Rs 64,478 crore. In addition to this would be the recurring cost of salaries. There were reports, later belied, that the National Democratic Alliance government had cut the corps to 35,000 troops just before Prime Minister Narendra Modi's visit to Beijing last May. However, the NDA, unwilling to appear soft on China, quickly clarified that the corps would be raised in full, even if over a longer period of time. In short, India's military is set to grow bigger and manpower expenditure will only rise. Analysts might argue that India's overall defence budget would grow in tandem with the economy, and can absorb growing manpower costs. In fact, with the 7th Pay Commission already finalising its report, manpower costs would grow faster than overall defence spending. With the OROP award linking all pensions dynamically with rising salaries, the pension budget would grow too. Alongside rising numbers, there is little progress on the second option of recruiting more soldiers and officers on 5-7 year "short service" contracts that do not entitle them to pensions. In exchange, the government would assist in "resettling" them in alternative employment at the end of their service. Both the 5th and 6th Pay Commissions proposed the 750,000-strong central armed police forces -- the Assam Rifles, Central Reserve Police Force, Border Security Force, Indo-Tibet Border Police, et al -- absorb military personnel who have completed seven years of service. This would save them training costs and stiffen their capability, badly needed after weaknesses have been repeatedly laid bare by lightly-armed Naxal guerrillas. However, the home ministry has steadfastly blocked this proposal. Parliament's consultative committee on defence has listed out its objections: inducting soldiers who have served seven years would make the central armed police forces older and "greyer"; the police function with a soft touch, while soldiers are trained killers; and laterally inducted army soldiers would bring along their service seniority, superseding direct recruits. Partly because of these objections, the defence ministry has never implemented a "short service" scheme for persons below officer rank. However, the officer cadre has, since 1963, had a "short service commission" of 5-10 years, later extendable to 14 years (officers must serve 20 years to be eligible for pension; other ranks get pension after 15 years), but this scheme has never brought in enough officers to materially reduce the pension bill. One reason is that the army, given its debilitating shortfall of about 10,000 officers, has been granting permanent commissions to a large percentage of short-service officers. Only a major expansion of short-service officers would bring down the bill for officer pensions, while a shift to shorter, 5-7 year, service tenures will reduce pensions for other ranks. Even if such radical changes were implemented by a ministry and a military given to conservative thinking, the benefits would become evident only after years, when the new "short service tenure" soldiers start retiring. For now, figures submitted by the defence ministry in Parliament show that some 50,000 serving soldiers will retire every year, swelling the ranks of the 2.25 million ex-servicemen and 600,000 widows who currently draw pension.